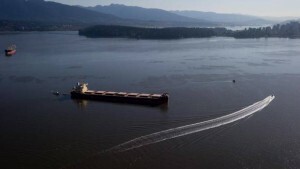 The fear of oil spills on Canada’s west coast was heightened by the recent small spill of bunker fuel, basically fuel oil, from a container ship parked in Vancouver’s harbour. Amidst all the furor over the recent spill, one question was missing: What would have happened to that fuel oil if it had not leaked into English Bay? It would have been burned, adding CO2 and a number of air pollutants to the atmosphere. Transporting goods around the world via ships represents around 3% of global greenhouse gas emissions, roughly the same as air travel, or all of Canada. A recent study by Alice Bows-Larkin and others in Nature Climate Change concluded that shipping emissions are going to continue to grow at a rapid pace into the future despite the availability of technological advancements in ship design and energy sources. 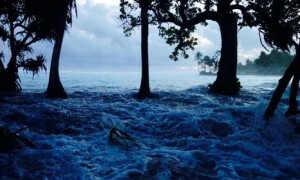 The question of tackling greenhouse gas emissions from shipping will be up for debate at the upcoming meeting of the International Maritime Organization (IMO)’s Marine Environment Protection Committee (May 11-15th, 2015) thanks to a push from a surprising source: the Republic of the Marshall Islands. This small Pacific Islands country may sadly be best known to outsiders as the site of U.S. hydrogen bomb tests in the 1950s. Why are the Marshall Islands leading the charge for regulation of shipping emissions? Thanks to the weird system of international shipping in which vessels fly the flag of distant countries in order to avoid regulations, the Marshall Islands is legally the home port of 3,400 large vessels. If you live in Vancouver or another port city, look through some binoculars at the back of the supertankers and container vessels and you will likely see one of three names: Panama, Monrovia (the capital of Liberia), or Majuro, the capital of the Marshall Islands. Unlike most economic sectors, shipping emissions are not part of the U.N. Framework Convention on Climate Change and thus not part of the emissions total for countries. Under the Kyoto Protocol negotiations, the responsibility for shipping emissions was handed to the IMO, similar to how aviation emissions were made the responsibility of the International Civil Aviation Organization. We are an island nation and shipping is one of our lifelines – we cannot survive without it. At the same time, carbon emissions, including those from shipping, pose an existential threat to our people and our country. Right now, the Marshall Islands and others are jockeying for support within the IMO, especially from neighbouring Pacific Island countries. They could use support from places like Canada, which pays attention to shipping fuel only when it spills into our waters. The federal government has spoken of making Canada a world leader in oil spill response. The recent budget included $13.9 million to fund research on effective response to oil spills, as well as money to help establish an International Maritime Centre in Vancouver. The next step is to deal with the oil that ships actually burn. This entry was posted in Features, Policy, Science by Simon Donner. Bookmark the permalink.